It’s easy to get the wrong idea about Biarritz. For while it’s true that it’s technically in the southern half of France, and it’s frequented by generations of affluent European families, it’s a different animal altogether to the resort towns of the Riviera. This particular pocket of land between the Pyrenees and the Atlantic is part of French Basque country: offbeat, edgy, characterized by cultural collisions. 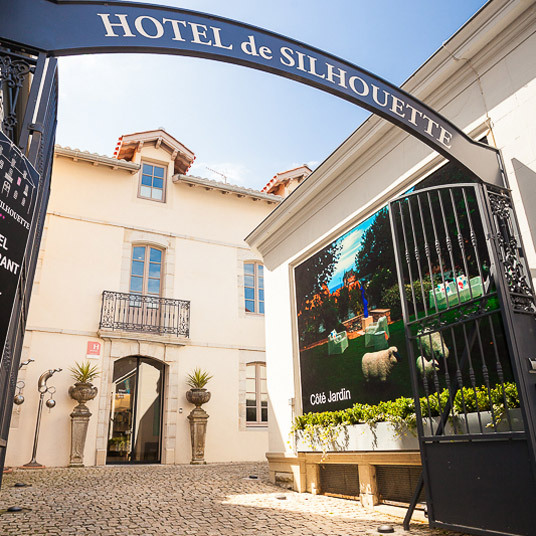 And Hôtel de Silhouette, as the might suggest, captures these contrasts, the dramatic light and dark of the region itself. Located inside one of the city’s oldest buildings in the Quartier des Halles, a neighborhood centering around a famed covered market, this twenty-room boutique looks charmingly antique from the outside. But the quaint cobblestoned entryway leads into quirky, colorful interiors where stately traditional pieces mix with sleek contemporary decor and experimental art. The look is whimsical: wallpaper lined with the coquettish pouts of old-fashioned French aristocrats, sheep statues on the lawn, velvet wall panels and throwback shag carpeting, plush white pillows painted with cartoonish magenta flowers, playful watercolor renderings of classic court paintings. 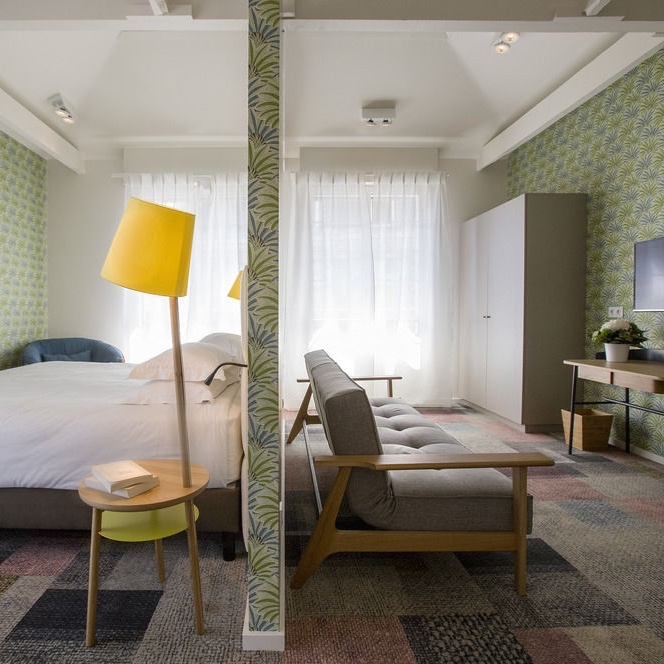 At Hôtel de Silhouette, guest rooms are small but stylish, outfitted with the standard comforts. 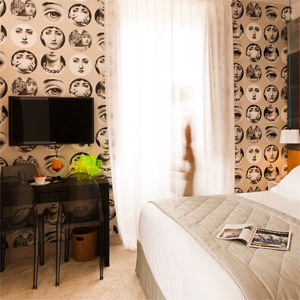 But the in-room details aren't what's notable here — think of the place as an art installation filled with fine details to discover. An ideal vantage point is the lovely terrace, ideal for afternoon tea or aperitifs, or, if you're lucky, a pop-up modern art exhibit or a ballet performance, part of Silhouette Exhibitions, the hotel’s ongoing cycles of art and music. Some rooms offer a small terrace/balcony.